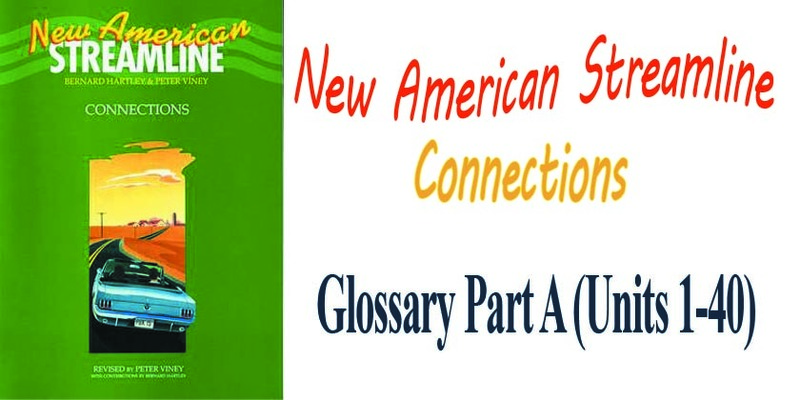 New American Streamline Connections Glossary Part A (Units 1-40) is provided for you to be useful, all difficult words of each units are explained with illustration and nature for students who are learning this book to learn ESL. Aboard: (adv. Prep) on or on to or into a ship, train, aircraft, etc. They were all aboard safe and sound. Cabin :(n) one of the areas for passengers to sit in a plane etc. The cabin was full smoke. Cruise :(n) travel by sea for pleasure or enjoyment. The cruise broke down into pieces. They were all standing on the deck. Sail :(v) to travel on water by ship or boat. Passenger :(n) a person who is traveling in a bus, car, train, plane or ship. The passengers are requested to turn their mobile off while traveling on plane. Terrible: :(adj.) Very bad, upset, making you feel very unhappy. Occupation :(n) job or profession. Itinerary :(n) plan of journey, record of travel. The itinerary was too short. The ship had WC in the cabins. Captain :(n) the leader or chief of a ship or aircraft. The captain of the ship told us to come down. Shower: (n) the act of washing with yourself with shower. The shower on the ship was not comfortable. Dressing table :(n) a low table with mirror where someone sits while dressing or applying makeup. The dressing table was cleaned by me. Closet :(n) a small room in a wall with a door that reaches the floor, used for storing things, cupboard. They were standing in front of closet. Boarding card: (n) a card that is shown before entering an airplane or ship. The boarding cards are on counter. Tourist :(n) traveler, visitor, or a person who travels for pleasure. My uncle is a tourist. By the way, I am pleased to meet you. The cruise was advertised as the ‘journey of a lifetime’. Customer :(n) a person who buys something from a shop. They know me–I’m a regular customer. Department: (n) part, section, branch of an organization. They work in the sales department. Extension number :(n) one the telephones that is connected with the main phone line. The extension number of our department is changed. They have connected both the wires. Inquire: (v) search to find the cause of something. They inquired us about the lost bag. I will assist you everyday for 1 hour. I need your assistance my friend to get admission form. He works as assistant in our office. Shortly: (adv.) soon, briefly, in few seconds. They answered them shortly about the case. Collect: :(v) come together, save, store. They collected all the work books. Directory: (n) a book containing addresses list of telephone numbers. The directory of my brother is lost. Message :(n) communication sent from one person to another. They send message to be there. Require :(v) need, have need of, lack. Dial: :(v) to press numbers. You can dial my number first. Tone: (n) a special sound of telephone. He is speaking in low tone. I haven’t made a sale all week. Operator: (n) a person who operates (runs) a machine. They had talked to operator once. Customer service: (n) a person who works in Telephone Company and provides the people bills and Connections for telephone. Our customer service center needs a good operator. Advertisement: (n) announce sth through TV/ radio/ news paper to make it popular. The advertisement was in newspaper. Accounting department :(n) a part or section for calculation. They work in accounting department. Incorporated: (v) include, combine, unite or mix. The new car design is incorporated with all the latest qualities. Fizz: (n) the name of powder or detergent. They use fizz, which is the best detergent powder. Coin: (n) a small piece of metal used as money. He had a pound coin in his pocket. Detergent: (n) a substance (powder) that removes dirt or a powder. Which detergent are you using now-a-days? Instruction: :(n) direction, tell someone how to use sth, information how to use sth. I need no instruction to one the computer. Laundromat: (n) a place from where we get our clothes washed and dry. The Laundromat is closed on Friday. Pile: :(n) a number of things that have been placed on the top of another. The washed the pile of clothes. They have the best selection. Identical :(adj.) Similar, exactly the same. The identical pens are lost by me. Dime :(n) a coin worth ten cents. Do you have sum dims? Launder: (v) to wash, dry and iron clothes. They have freshly laundered clothes. Slot :(n) hole, opening, and window. The coin slot of the machine was broken. Temperature: :(n) the degree of hotness and coldness. The temperature of our city is the lowest. Insert: (v) to put sth in. You can insert the coin in slot. The trucks waited at the garage to pick up their loads. Measure: :(v) to find out the exact size of sth. Can you measure a ship’s speed? Extra: (adj.) unnecessary, more tan is needed. We need some extra sheets. Warm :(adj.) Neither hot nor cold. The weather is warm today. Update :(n/ v) to give sb the most recent information about sth. They can give us some update about the match. Olympic: (adj.) an international sport festival held after four years. The Olympic Games will start soon. Satellite :(n) a machine in space which communicates radios, televisions etc. They are watching match live by the help of satellite. Live: (adj.) seen or heard as it happens. The match is going on live on sports channel. Complex :(n) a set of buildings consisting of several parts. They went to sports complex. Event :(n) sth that takes place, happening. The 300 meters running is the fourth event of the afternoon. Freestyle :(n) a swimming race in which competitors can use any stroke they want. They are watching freestyle swimming. Javelin :(n) light spear thrown in sport. They don’t know what Javelin is. Competitor :(n) one that competes with another, one who takes part in competition. All the competitors are given flowers. Gymnastic :(n) game of athletic. The Gymnastic match will start after this. Gymnasium :(n) room or building where games are played. They went to gymnasium with me. Routine :(n) the normal activities one does everyday. They don’t have any special routine. Average :(n) mid point, center, and medium, a usual. The average typing speed is 40 WPM. Score :(n) a number of points, goals, made by a player in games. The final score of football match was 1-2 goals. Bar :(n) long piece of material (metal) over which jumpers jump. The bar was too far to jump. Hurt :(n) cause pain or injury to. Did you hurt yourself badly? Disappointed: (adj.) one who loses hope, upset. They disappointed me with bad news. Gymnast :(n) one who, does gymnastic. The gymnast was standing in line. They judge give him good points. Slip: (v) loose one’s footing or balance. He slipped badly while he was sleeping. Hit:(v) bit, strike with force. I hit him with stick. Dash: (n) a short running race. He had taken part in dash. They lost the match unfortunately. Certainly: (adv.) definitely, surely, no doubt. Certainly, he is going to come with me. Guy: (n) man, gentleman or person. He is a very nice guy. Can you tell me what the matter is? Announcement: (n) make publicly know. They announcement of program was good. Soda: (n) a sweet drink containing carbonated water, drink. They don’t want to have soda. Arrive: (v) reach a destination; come to the end of a journey. They arrived here this morning. Did you fax the letter? You have a wonderful idea. Do you see the writing on the screen? Pick up your pen and notebook. Your idea is very stupid. He will live here forever. Find out the meaning the words given below using the dictionary. Make meaningful sentences for the words given below. Match the 10 words in Column I with the definition in Column II. _______ 9. Fizz j) job or profession. Studio :(n) a room where radio television program is recorded, where music is recorded. They went to studio with my father. Clerk :(n) a worker in shop, office, bank, hotel or cashier. The clerk is working in the office. Compass :(n) an instrument with needle showing the direction. They can use the compass to find way. Grand child: :(n) A child of one’s son or daughter. They are going to meet their grand child. Library :(n) collections of books; room or building where there are kept. They were all at library. Motor boat: (n) motor driven boat. The motor boat was sailing in the sea. Two-way radio: (n) (of a radio) capable of transmitting and receiving signals. I bought a two-way radio. Voyage :(n) journey esp. a long one by sea or in space. The voyage was quite boring. Navigate :(v) to find direction by using maps and other instruments. They navigated by the help of stars. Retired :(adj./v) to stop ones job due to oldness. His father is retired clerk. Several :(adj.) more than two but not many; a few. They had several chances to win the match. Quite :(adv.) completely, wholly, entirely. Actually: :(adv.) as a fact, really. Actually I came to meet you. Dream :(n) series of scenes or feelings in the mind of a sleeping person. I had a bad dream about my school. Have you ever had a nightmare? The pills were too strong. Follow :(v) go or come after (a person or thing ahead). They must follow our instructions. Shake: (v) move quickly up and down. They were shaking the bottle. Rescue :(v) save or set free from danger or harm. They rescued the people from sea. They had no baggage with themselves. Aircraft: (n) Machine capable of flight, esp. an airplane or helicopter. The aircraft was carrying passengers. Alarm clock: :(n) Clock that rings at a set time. They bought new alarm clock. Claim area: :(n) a place where someone enquires (asks) for sth. Esp. in airport or hotel. They were stand at the baggage claim area with me. Cheesecake: :(n) tart filled with sweetened curds etc. I have never eaten cheesecake. Mirror :(n) Polished surface, usu. F coated glass, reflecting an image. They were standing in front of the mirror. Believe :(v) accept as true or as conveying the truth. They must believe me because I am not telling lie. Percent :(adj.) in every hundred. House prices rose five percent last year. Flight attendant :(n) a person who serves food and drink in airplane. The flight attendant served us food. Hurry :(v) to do sth more quickly than usual because there is not much time. They must hurry to catch the bus. Asleep: (adj.) in a state of sleep, when any body is sleeping. I waited until they were all fast asleep. Take off: (v) leave, to go in a high position. The plane took off early from here. Suddenly: (adv.) at once, happening unexpectedly. There was a bad noise and we woke up suddenly. She went to drugstore to bring medicine. Can :(n) metal vessel for liquid. They brought us some cans of beans. Antiseptic: (adj.) medicine used for destroying certain germs. The antiseptic tooth paste must be used to have good teeth. Capsule :(n) small edible soluble case enclosing medicine. The capsules did not make me feel batter. Earache :(n) pain in the inner ear. She has a terrible earache. Fluoride :(n) medicine made of fluorine keeps the teeth from decay. The tooth paste has fluoride in it. The gums were thrown everywhere in class. Mouthwash: :(n) liquid for rinsing the mouth. We must buy mouthwash for them. Ointment :(n) smooth and oily cream used for injuries. Doctor suggested me antiseptic ointment. Prescription :(n) the written instruction of doctors. Doctor gave me prescription and I lost it. Sore throat :(n) having pain in throat. Spray :(n) water etc. flying in the form small drops. We must use body spray as a perfume. Throat lozenges: (n) sweet tablets for sore throat. They went to buy throat lozenges from drugstore. They need some tissue papers. Vitamin :(n) any various substances present in many foods and essential to health and growth. They are using tablets which have vitamin. Backache :(n) having pain in back. She has no backache at all. Drops :(n) small round liquid of water. We must use eye drops to feel relax. Session: (n) a period of time spend doing particular thing; meeting. The next session is going to begin. Acoustic guitar :(n) a kind of simple guitar, no electric one. They are playing acoustic guitar. Chorus :(n) a group of singers, choir. Everyone joined in the chorus. Stretch limo: (n) large luxurious car. I saw his Stretch limo which was very colorful. Garage: :(n) a place where cars and trucks are serviced and repaired; service station. The garage was full of smoke. I want to talk to him right away. The bass was too high. Cigar :(n) light roll of tobacco-leaves for smoking. They bought new cigar for others. We don’t need any cookies right now. We went with our friend in a car on freeway. Fur :(n) a short fine animal hair. The cat’s fur feels soft. Leather: (n) material made from the skin of an animal. They are wearing shoes made of leather. Manager: (n) a person controlling a business or a part of business. The manager solved our problem. Pea :(n) a hardy climbing plant with edible seeds. They bought pea for us. Present: (n) a thing given as a gift. They gave us present when they came from Iran. Rose :(n) prickly bush or shrub bearing usu. fragrant red, pink, yellow or white flowers. Nobody hates rose at any case. Silk :(n) cloth produced by animals. They were wearing silk clothes. Stereo: (n) a CD player or cassette player. They had bought new stereo. Brand new :(adj.) Completely new. The car was brand new. Stale :(adj.) no longer fresh, out of date. We need no stale cigarette. They were not able to guess correctly. Sneaker: (n) gym shoe, tennis shoe, shoes worn during exercise. They can’t go to school with sneakers. That was a complete fiction. Planet: (n) large body in space that moves around stars esp. sun. We will study a story about science fiction. He went to moon in spaceship. They put it on the surface. The spaceship descended on the surface of moon. He is stuck in the car. This story is very strange. Many animals live in the forest. Please put on the spacesuit and come with me. They rescued us from danger. We will land on the moon after one hour. Please stick the notice with it. 3. Science fiction :(n) __________________________________. 7. Put on :(v) ________________________________________. 1. Her skin was as smooth as___________. 2. The new ____________has come to assist us in our work. 3. He always plays his stereo with the __________turned right up. 4. She has a weekly __________at the health club on Saturdays. 5. A cloud of fine __________came up from the waterfall. 6. These medicines are not available without a__________. 7. Let me mix some __________of milk into the cake mixture. 8. The medicine can be taken in tablet or ___________ form. 9. We drank a __________of Coke each a few minutes ago. 10. You’ll have to _________if you want to catch that train. Actor :(n) a person who acts in movies, hero. I don’t like the actors. Counter :(n) a person who deals with money in bank, business or hospital, flat surface on which goods are sold. They were all standing beside counter. Destination :(n) aim of journey, purpose. What is your destination, Sir? Highway :(n) main road, public way. The highway was blocked by cars. Luggage Cart :(n) a vehicle used for carrying goods/luggage esp. in the airport; trolley. He was carrying the luggage cart alone. The rock came down dangerously. Marry :(v) get wife or husband. I married her in 1999. Boss :(n) head, chief, or a person who controls the workers. Boss is calling you in the office. Date :(n) a meeting arranged in advance; appointment, meeting. What is the date today, buddy? Recruiting :(v) act of selecting a soldier, selection for army. Is he recruiting himself in Air Force? The janitor broke the window. Commercial :(n) an advertisement/break on the radio or on television. Let me see the commercial then I am going to answer. He did a terrific job today. They must let him come out of latrine. Opportunity :(n) favorable chance, having free time. They got the opportunity to finish the match. Communication :(n) exchanging of ideas; the action of communicating, message. All channels of communication need to be kept open. Expert :(n) professional, job, and occupation. He is expert in making new designs. Career :(n) profession, job, and occupation. She has been thinking on her career. Pension :(n) money that is paid after retirement. He got his pension yesterday. The sergeant came to our office today. Obey :(v) to do what is said to do. We obey all the rules and regulations. Straight :(adj.) direct, without bend. You may stand in line straight. Downtown :(n) center of a town or a city. I saw him walking downtown with his friends. They surveyed the entire town. Conduct :(v) to do Sth, perform, or carry out. They conducted a test from him. Major :(n) big, chief, head. His father is major in Army. Transit :(n) going or moving of things or people from one place to another, transportation system. They said goods are damaged or lost in transit. Mall :(n) a large place with many shops. Let’s go to the mall. Mile :(n) a unit for measuring equal distance to 1609 meters. The nearest bank is about half a mile down the road. Metropolitan (adj.) a person who lives in a city. They live in the New York metropolitan area. Applicant :(n) a person who applies for a job. The applicants can fill this form out. Graduate :(v) to pass school or college course, get a degree of college or university. The have graduated from Balochistan University. Transfers :(v) to move from one place or job to another, transport, relocate. They had transferred their account from here. Credit card :(n) a small plastic card that you can use to buy goods and pay for them later. They lost the credit card in the bus. Currency :(n) money in use in country. They currency of Pakistan is rupee. Identification :(n) sth that proves who somebody is, recognition. I need some identification for admission. Expect :(v) to think that sth will happen. Don’t expect sympathy from me! Include :(v) contain, have as a part, or consists of. They included all the points in it. Cash :(n) money in the form of bills or coins. They had cash not credit card to pay. Check :(n) a written order directing bank to pay money. What is the rate of the book? They have for an excursion of two months. The ship passed through Swiss canal. We will visit the pyramids next year. 1. He was really _________when I was in trouble. 2. I tried to run but my legs just wouldn’t ___________me. 3. You’ll have the _________to ask any questions at the end. 4. The next morning we ___________the damage caused by the fire. 5. We did about 30 __________a day on our cycling trip. 6. You’ll need some cash in local __________. 7. There were over 500 ___________ for the job. 8. The tour _________a visit to the Science Museum. 9. The number of reported crimes is increasing at an alarming___________. 10. How can I ________money from my bank account to his? They went to see the boxing championship. They horn their bells loud in traffic jam. The umpire was standing in the ground. Racket :(n) instrument by which shuttle is hit in tennis game. The racket was broken into pieces. His father was a boxing champion. Import :(v) to bring something (product) in from another country. They imported some computers from Japan. Export :(v) to send something (product) to another country. They exported some apples to Iran. She seems to be sick today. They had match versus 7th class. Portable (adj.) Able to be carried by hand or on the person; easily moved, carried, that can be carried. They had a portable radio with themselves. Exciting :(adj.) causing great interest, interesting. I like doing exciting things. Focus :(v) to direct attention to something. They must focus on their studies. Disappear :(v) to go out of sight, pass away, or go away. They disappeared in the rush. There’s no point getting upset about it. We grew up in the same neighborhood. Cheer :(v) shouting of joy. They must be cheered for good performance. Representative (of sb/ sth) :(n) a person who represents others idea. The representatives are requested to come on stage. Secretary :(n) a person who keeps paper records, arranging meetings, receiving calls in an office. The secretary brought the letter to me. The reference was not quite clear. Bachelor’s degree: a person who holds a first university degree. He has gotten his bachelor’s degree from Iqra University. Administration :(n) management of affairs of business, the activities that are done in order to run a business. I like their administration a lot. Secretarial :(adj.) Work belong to the job of secretary. The secretarial work is quite tiresome. Bilingual: (adj.) of two languages, a person who knows two languages. She is bilingual in English and Punjabi. Alarm :(n) a warning sound, a sound which warns the people because of any danger or any problem. She decided to sound the alarm. Disaster :(n) bad event, bad happening, flood, fires and volcano that kills a lot of people. Thousands died in the disaster. Earthquake :(n) shaking of the earth. The earthquake in Quetta was a great disaster. Volcano :(n) fire which comes out of the earth. An active volcano may erupt at any time. Elevator :(n) lift, a machine which carries people and goods from one level to other levels in a building. They were in elevator when we arrived. Toward :(Prep.) at the direction of something. They all went toward the down town. Survive :(v) to remain alive after a disaster. They all survived after the disaster. Scream :(v) to shout, frightened. The people were creaming when there was a blast. Rush :(v) to go or come with a great speed. Everyone rushed to the elevator. The eruption of volcano took place at 1O’clock. Field :(n) land, farm, and section. The field was completely burnt down. Harbor :(n) a place where ships can shelter (stop). They were waiting for us at the harbor. Island :(n) an area that is surrounded by water. The island was very beautiful. Lava :(n) liquid coming out of earth during volcanic eruption. Lave came down and burnt each and everything. Nap :(v) short sleep, esp. during the day. Skyscraper :(n) a high building. They were standing on a skyscraper. Storm :(n) very bad weather with strong winds and rain, and often lightening. Storm shelter :(n) save place from storm. They were unable to find any storm shelter. Tornado :(n) storm with strong wind. The tornado blew everything when we came. The roof collapsed down suddenly. They rescued us in the sea. Dictate :(v) to tell words to somebody to write. They have dictated us all the points. Robe :(n) a long loose outer garment reaching to the ankles. Blow away :(v) the wind which takes (blow) something away (far). The storm blew the things away with huge power. Fortunately :(adv.) Luckily, by good luck. Fortunately he was not late on the test day. The students must sit close to each other. Diet :(n) advice for what you eat. The doctor advised him to be on diet. Nephew :(n) son of one’s brother or sister. My nephew got 1st position in class. Plan :(v) to make a program. They have planed to escape from prison. “What is the plan?” asked Javed. Hope :(v) to want something and think it possible. They hoped to win the match. Fond :(adj.) Kind and loving, to wish, to expect. They all are fond of playing football. Enclose :(v) to put walls etc. around something, parcel, package. They have enclosed the documents. Recognize :(v) to know sb/ sth when you see. They did not recognize me till I did not show my ID card. Regard :(v) respectful attention to somebody. Her work is very highly regarded. Sharp :(adj.) Having fine edge that can cut easily. He heard a sharp intake of breath. Scratch (n/v) mark or damage skin slightly with sth sharp. They scratched the card without wasting the time. Blood :(n) red liquid containing oxygen. They need B+ blood for the patient. Bleed :(v) give or loose blood, flow of blood. He was bleeding when I came. Dumb (n/adj.) unable to speak. He is the one whom we call dumb. Anniversary :(n) a celebration of an event. They anniversary of their marriage will be held tomorrow. Microwave :(n) a machine that keeps the food warm. The microwave oven was working well. Fabulous :(adj.) Very good, marvelous. They were looking fabulous in red dress. Automatic timer: a part of machine which starts and stops it automatically. His mobile has automatic timer. Alligator :(n) of crocodile family which lives in the sea. The alligator was very dangerous. Church :(n) mosque of Christian people. Most of the people don’t go to church. Concord :(n) a very fast airplane, friendship, harmony. Pakistan loves to live in concord with neighboring countries. Customer :(n) a person who buys sth from a shop. The costumers were buying things from shop. Expressway :(n) motor way, superhighway. They were passing over the expressway. Parakeet :(n) a small parrot usually with a long tail. The parakeet flew away when I set it free. Pet :(n) a domestic animal. I like to keep pets at home. Sack :(n) a large bag used for carrying things. They were carrying sacks of wheat. Laptop :(n) a small computer, microcomputer, carry able computer. He uses laptop in his office. Bite (2nd form=bit) :(v) to eat into sth with teeth, the action or an act of biting, chew. The dog bites him everyday. Recommend :(v) to say which one is better, suggest, advice. He recommended me to use new pen. He needed to find a mean between frankness and rudeness. Popular :(adj.) Liked by people, famous. Salman Khan is very popular in India. Unusual :(adj.) Uncommon, not common. They had an unusual meal at the hotel today. Ali surpassed Javed in making fun of some one. Jumbo jet :(n) a large aircraft for passengers (jumbo=large). The Jumbo jet flew passed us. Rottweiler :(n) a large dog that can be very fierce, angry and strong. The brought a Rottweiler from a pet shop. Score (n/v) mark, point to achieve. The final score of football match was 0-0 between Iran and India. Traditional :(adj.) to be the belief of, a customs belong to a nation. They were wearing traditional clothes. They dog must be named devil. Statement :(n) report, any written or oral opinion, announcement. The statement about the blast was true. Alibi :(n) a formal statement that a person was in other place at the time of crime, proof, justification. The alibi told us all about the accident. Branch :(n) a part of sth or group. The branch of our center is in Kabul too. Detective :(n) a person esp. a police officer whose job is investigating and solving a problem, police officer. The detective told us not to move. Lie :(v) to put one’s body on a surface. They lied down on the floor when police asked them. Remember :(v) to keep in memory (mind). They remember the entire story. Save :(v) to rescue sb or sth from danger. He has saved some money for buying new car. The detective shot him twice. Racetrack :(n) a line which runners follow it, track for motor racing. The racetrack was full dust when cars passed. Security guard :(n) a person whose job is to guard (protect) sth or sb. The security guard was killed by unknown people. Robber :(n) a person who steals things. The robbers killed the gun man. Teller :(n) a person who gives and takes money in a bank, cashier. The teller put the money in front of the robbers. Arrest :(v) to take or keep somebody in a prison (jail). Nobody has arrested them yet. Force :(n) make sb do sth that he/she does not want to do. They force forced them to move back. Escape :(v) to run away, to go away because of any problem. They did not want to escape. Financial :(adj.) Connected with money. They have some financial problems. District :(n) place, region, or area. The CM did not go to Karachi district. Interrogation :(n) investigation, to ask questions from sb in formal way. Nylon :(n) a very strong artificial fiber used for making clothes, rope, and brushes etc. The thieves were wearing nylon stocking on their faces. Nylon and other man-made fibers are available in bazar. Silver: (n/adj.) metal, grayish white. They are wearing silver color dress. Surgeon :(n) a doctor who performs medical operation. The surgeon told us to take him to another hospital. Backyard :(n) an area of the house, yard behind a house etc. garden, plot. They were all playing in backyard. Nut :(n) a fruit having hard skin with a softer part inside that can be eaten. The nut was not too hard to break. Band :(n) a group of musician who play pop music. The band was very famous in our area. Album :(n) a collection of pieces of music. They have released new album. Pool :(n) an area of still water. The pool was full of people. Barbecue :(n) out door meal, dinner, lunch, or a party at which food is cooked. Candy :(n) a sweet food made of sugar. The candy was a lot. Dip :(v) sauce in which food is dipped. They dipped the cookies in tomato sauce. Dip :(v) to wet sth by putting it into any liquid like tea, coffee etc. and bring it back. They dipped the cookies in tea. Punch :(n) a drink usu. made from wine mixed with water, fruit, spices, etc., and often served hot. They have invited us to thanksgiving party. Scene :(n) special part of movie, section of a movie, picture, sight. Firefighters were on the scene immediately. Zoologist :(n) a person who studies animals and their behavior. They had no Zoologist to give us lecture. Sob :(v) to cry noisily. I heard a child sobbing loudly. Argument :(n) a discussion in which people disagree, fight. They had argument about the money. Selfish :(adj.) One who likes himself/herself, self interested. They were all very selfish workers. Palm tree :(n) a tree which gives date. They were standing under the palm tree. Crowd :(n) together closely around something or somebody, a large number of people. The crowd was cheering and booing. Coast :(n) a land near or beside the sea. The coast was full of dirt. Grammar :(n) the study of rules of a language. Translate :(v) explain the meaning of a word or text. They can translate the word without any problem. They are very rude to their friends. He is a senator in the country. We will miss you in your absence. We have a good environment here. They don’t know anything about politics. I will give you a present. _______ 5. Rude e) a land near or beside the sea. The boxing contest was very interesting today. Contestant :(n) the person who takes part in a contest. The contestants were all ready for their turn. Nod :(v) to move one’s head up and down to say YES. They nodded when I asked the question. They were all shaking hands together. Nervous :(adj.) Afraid of something, worried. He was very nervous when he was alone at home. Dishwasher :(n) a person or machine that washes dishes. The dishwasher went out without telling anything. Jackpot :(n) a large amount of money that is the most valuable in a game. They won the jackpot last year. Automatic :(adj.) Working by itself, without human interfere. It is a fully automatic driverless train. Nursing home :(n) an institution, esp. a small private one, providing health care esp. for the elderly. They were all working in nursing home. League :(n) group of sports clubs competing against each other. The league will start tomorrow. Age :(n) the length of time that a person has lives. Would you mind telling me your age? He was lost in the woods. Grandparent :(n) parent of one’s parent. My grandparents are living in Islamabad. Will :(n) legal written statement after death, legal declaration for the disposal of one’s property after death. Her decision to continue shows great strength of will. Sale :(n) the action of selling things. They need no assistant now. Urgent :(adj.) Essential, important, serious, needy of immediate action or attention. They urgent work made him come late. Immediately :(adv.) at once, with nothing between, as soon as, without pause. They came to center immediately. Smuggle :(v) to take or send things illegally, transportation of goods illegally, import and export goods illegally. Smuggler :(n) a person, who smuggles. The police man killed smuggler. Border :(n) line between two countries. He was sent to border to protect the country. Traveler :(n) a person who travels. The traveler was not having enough money. Suspicious :(adj.) Doubtful, not certain, not sure about sb or sth. The man was suspicious about the roommate. Search :(v) try to find something, look for. They searched the room for finding the book. Champagne :(n) expensive French wine. The champagne was very expensive. While (conj) a period of time, during. They went out while I came home. Period :(n) the length of time. The second period overs at 5:45. Custom :(n) duty on import and export, way of life, tradition. The custom of our society is quite unusual. Retire :(v) stop working because of age, leaving work because of oldness. They retired at the age of 25. Survey :(n) methodical investigating, view, examination, or inspection. The survey was very difficult honestly. Wild life :(n) animals living in nature, wild animals. They were watching wild life in National Geographic. Questionnaire :(n) list of questions. The questionnaire was prepared for level Four. Amuse :(v) entertain, surprise, cause to laugh or smile. They are amused by the jokers. They got shocked when they saw the result. Embarrass :(v) ashamed, to make sth feel shy. They embarrassed Ali in front of all the staff. Annoy :(v) irritate or trouble, anger. They made him annoyed talking about past. Cabaret :(n) an entertainment provided in a restaurant etc. while customers are at table; a restaurant, nightclub, etc., providing such entertainment. He made his name on the cabaret circuit. Comedy :(n) funny plays in movies, joke. He didn’t appreciate the comedy of the situation. Comment :(n) opinion, observation, or view. They did not want to give any comment on this problem. Episode :(n) part, section, chapter, passage, scene. The last episode of drama was very interesting. She is afraid of horror movies. Series :(n) sequence, chain, course, string. The booklet must be put in correct series. Soap opera :(n) a story about the lives and problems of a group of people mentioned in the movies. They couldn’t reach here because of violence. Mail :(v) post, to send something by email. They have mailed all the letters. Funny :(adj.) Causing to laugh or smile. Does it look so funny that you all are laughing? The best worker’s award goes to Mr. Javed. Extract :(v) draw out, dig out. They have extracted the number from diary. I guess he is right most of the times. Twin :(n) either of two children born at a single birth. The twin brothers are waiting for us. Gasoline :(n) petrol, liquid from petroleum, used esp. for motor fuel. The rate of gasoline has risen again. Kidnap :(v) to hold or carry a person away by unlawful force or fraud. The boy was kidnapped today. Bark :(v) cry of dog. The dog was barking at us. Congratulation :(n) express sympathetic joy, well done. Congratulations! You have won the grand prize. Hill :(n) slope, naturally raised area of land, high land, rising ground. They were living close to high hills. Hero :(n) A man, now also a woman, admired and venerated for his or her achievements and noble qualities in any field. The hero was dancing very well. Pair :(n) double, two things of the same kind. The pair of shoes did not match at all. The ones who tolerate get the reward too. Alive :(adj.) Living, not dead, in life. They remain alive after the disaster. Brave :(adj.) Able to face and withstand danger or pain. His brother is a brave person. Bravery :(n) courage, courageousness, boldness, ability to ignore fear and dangers. They are telling the story of their bravery. Freeze :(v) turn into ice, (frozen= 3rd from) . They freeze the water in freezer. Teenage (n/adj) the period of a person’s life from the ages of thirteen to nineteen. The boy has killed a lot of people in his teenage. They did not have any trouble in finding the way. Article :(n) thing, item, or piece of writing paragraph. The article was all about the politics. Surgery :(n) the branch of medical practice which treats injuries and other bodily disorders by physical Operation, treatment of disease. They had surgery two weeks before. Heart :(n) the hollow muscular organ which in vertebrates (animals having spinal cord) keeps up the circulation of the blood. The heart says get what you want. Menu :(n) A list of the dishes to be served at a hotel or meal or available at a restaurant etc. The menu was full of new things. Medical store :(n) store where medicines are available. They went for tablets to medical store. How The English Language is Used?